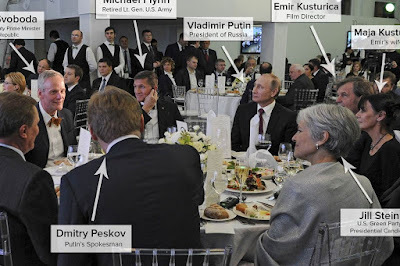 Stein dined with Russian president Vladimir Putin during a 2015 Moscow event that was also attended by Donald Trump’s former national security adviser, Mike Flynn. Politico reported in September that Stein was the beneficiary of Russian-bought political ads on Facebook. Those who still stay awake at night will remember that the votes Stein got in Wisconsin, Michigan and Pennsylvania -- and Hillary Clinton didn't -- were more than enough to flip the long-blue states red.